The MHT-CET or Common Entrance Test is an annual entrance exam conducted by the Government of Maharashtra. It is conducted by the Directorate of Technical Education. The degree courses of Engineering & Pharmacy streams are mainly accounted for in this entrance exam. 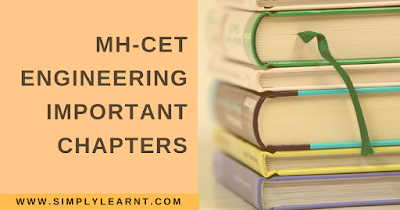 In order to crack this entrance test, you must know about the most important chapters and exam related information. When you have prepared these chapters, take some improvement test and recap test to evaluate your performance till the time.